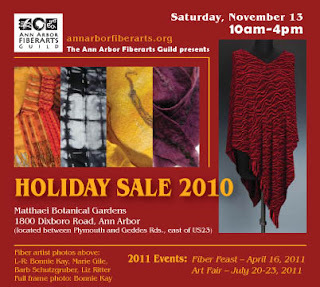 I'm a member of the Ann Arbor Fiberarts Guild, and our annual holiday sale is this Saturday, November 13 at The Matthaei Botanical Garden. There will 40 artists selling their work- weavers, knitters, dyers, spinners, felters, sewers, and dollmakers. There are some incredible skilled artists in the guild! Buy handmade holiday gifts for friends and relatives, and support local artists!